Since 2009 has been designated the International Year of Astronomy, we, along with our guests, have been spending more than one evening this month checking out the night skies. We’ve had some awesome opportunities for viewing starry objects the past few nights, with crystal clear skies (and, as always, an extremely low amount of light pollution here inside Pisgah National Forest). This place is just great for stargazing. Our favorite item in the winter sky is the constellation known as Orion. 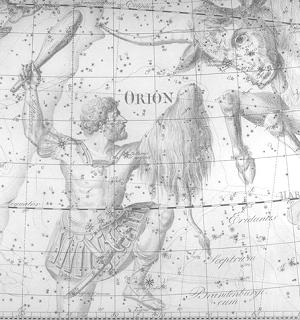 According to one story in Greek mythology, the hunter Orion died after being stung by a scorpion. The gods put Orion in the sky so that he sets in the west while his slayer, the constellation Scorpio, rises in the east. Orion has two hunting dogs, Canis Major and Canis Minor, who accompany him as he fights Taurus, another nearby constellation. Three bright stars make Orion’s belt an easily distinguishable feature in the constellation. However, did you know that there are some really beautiful objects in Orion as well? Two recent entries from one of Brigette’s favorite websites, NASA’s Astronomy Picture of the Day, have two great shots of Orion, at least one of which was taken by a digital camera attached to a small telescope. Three cool things to look for are the Horsehead Nebula, the Flame Nebula and the Orion Nebula. This entry was posted in Uncategorized and tagged stargazing, Winter by Inn on Mill Creek. Bookmark the permalink.